What is This Huge Wooden Structure in Solana Beach? A 10-by-15-by-60 foot wooden structure on the south side of the San Elijo Lagoon in Solana Beach is drawing lots of interest and questions. What is it? What will it be used for? Is it permanent? 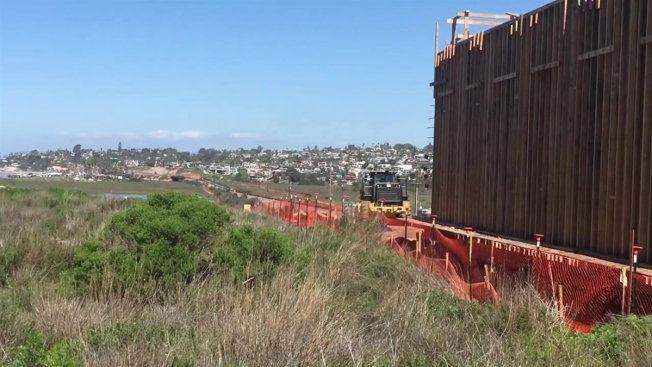 According to San Diego Association of Governments (SANDAG), the huge wooden structure is being constructed to help build a pedestrian tunnel that will eventually go under the railroad tracks. The tunnel is part of the North Coast Corridor Program’s community enhancements. The wooden frame is expected to be installed this weekend during a planned work window, when rail traffic is shut down on the coastal rail corridor to accommodate construction. The pedestrian tunnel is scheduled to open in two years upon completion of the San Elijo Lagoon Double Track Project. The new undercrossing will connect trails being planned by the City of Solana Beach and the San Elijo Lagoon Consrvancy. The North Coast Corridor Program, a $6 billion multi-agency effort that will include wider freeway bridges, new carpool lanes, double-tracked railroad bridges, 10 miles of new bike paths, multiple pedestrian walkways and crossings, and the complete restoration of the San Elijo Lagoon. SANDAG is working in collaboration with NCTD, Caltrans, and the FTA to design and construct the San Elijo Lagoon Double Track Project, a planned rail improvement project that extends between the cities of Encinitas and Solana Beach. The project has two main elements. It will add 1.5 miles of second main track from Cardiff-by-the-Sea to the southern border of the San Elijo Lagoon, and replace the more than 60-year-old wooden trestle San Elijo Lagoon rail bridge with a modern, double-track, concrete bridge. The new double track will create more than four miles of continuous double track on the LOSSAN coastal rail corridor, eliminating the need for meeting or passing trains to take turns using the single track.